Last summer I was reminded how uninteresting the lion's share of boys' footwear can be as I searched high and low for a pair of versatile sandals. Then I saw the Livie & Luca Barcelona sandal. I wanted something simple that would be both casual and dress-upable as well as durable and comfortable. This sandal was a champion. The leather is so soft and it didn't seem to ever scuff or wear visibly, even after three months of nearly daily use. 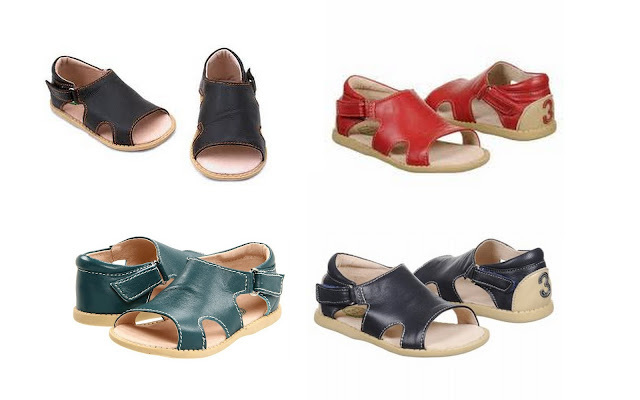 This sandal comes in brown, teal, and there are red and navy versions that go by the name Diaz instead of Barcelona. The Diaz have numbers on the heels, 3 on the left and 7 on the right. Full price for this sandal falls in the $48 to $51 range. Finding some colors and sizes can be tricky because some of the colors are from previous seasons. You can get the red ones on sale here in a size 4 and here in a size 5. The teal are a good bet here at 40% off ($28.80). Navy also is only available in a tiny size 4 from shoes.com, but if you enter the coupon code 25SALE it takes 25% off the sale price, making the new total $25.20. Brown are available at Amazon and Endless.